Why Is Your SharePoint Stalled? You know that SharePoint can be successful. You’ve heard stories of enterprises that live and breathe through the solutions that they’ve created using SharePoint. But, you can’t seem to get there with your own organization. No doubt, you’ve also heard stories of failure at other places and you want to ensure that your deployment doesn’t end up like that. When you’ve done as many implementations as we have over the years, you pick up a few things along the way. You learn what matters for a successful SharePoint implementation and what doesn’t. What matters most isn’t the technical stuff. The Nine Keys aren’t technical details or tasks on a checklist. Technology, as it pertains to SharePoint, is the easy part. You can find hundreds of resources for step-by-step deployment of the infrastructure and integration to active directory. Development is even easy these days, with guides, courses, and tools that make the process of developing the site easy, or at least possible, by following the recipes. The real challenge is the organizational change – the move from helplessness to effectiveness and self-sufficiency. You want to empower users to be more resourceful, more efficient, and more productive. You want to enable the business to do more and to do it at lower cost. But it’s not clear how to do that. The Nine Keys are compiled from more than 10 years working with SharePoint and hundreds of conversations with clients of every size. Distilled from practical experiences and observations, the Nine Keys cover the most commonly neglected elements of SharePoint projects. 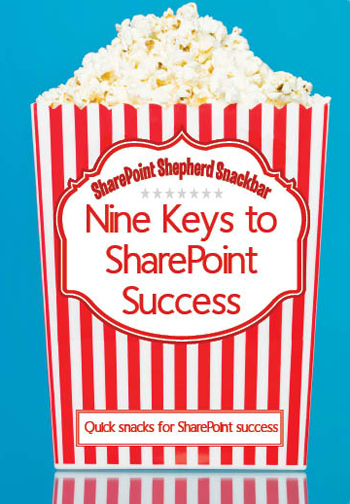 With these Nine Keys, you can engage, encourage, and involve the business and users to reignite your SharePoint project and achieve success. The hour-long video is filled with techniques you can really use to ensure your SharePoint deployment is successful. With specific guidance for building consensus and maintaining focus on critical concepts, you’ll hear about each of the keys to success and then get a prescription for applying that skill in your own organization. You’ll learn how to build a shared vision – even when it seems like everyone has a different set of ideas. You’ll learn how to frame conversations around the right concerns, how to define what success looks like, and how to measure it. The video itself is 57 minutes long of Robert Bogue passionately sharing stories and techniques for ensuring your SharePoint deployment is successful.